Yes there's a pile of spares in boxes, I believe there's a dauphine brake set up amongst it. I'm informed that an R10 rack is desirable, but I'm looking at chemical stripping and welding first. Everything is easy relative to the body I expect! The R10 rack might be better but also compromises turning circle a bit I'm told - I've driven a 4CV with an R10 rack and I didn't really notice that though. My car is on its original rack and I'm OK with it. Pretty low geared but, like some others, I've thrown out the return springs. I've been lucky that the car came with so many spares, including a full set of hanging panels. Getting the body right is the priority. Nice to have the panels. I got a pretty reasonable rear guard from a wrecker at Sandy Creek, near Gawler in SA a couple of years ago and he had more on a car there. When I think about what I threw away 45 years ago I could cry..... Still, only so many are really needed. Can anyone remember who wants one? 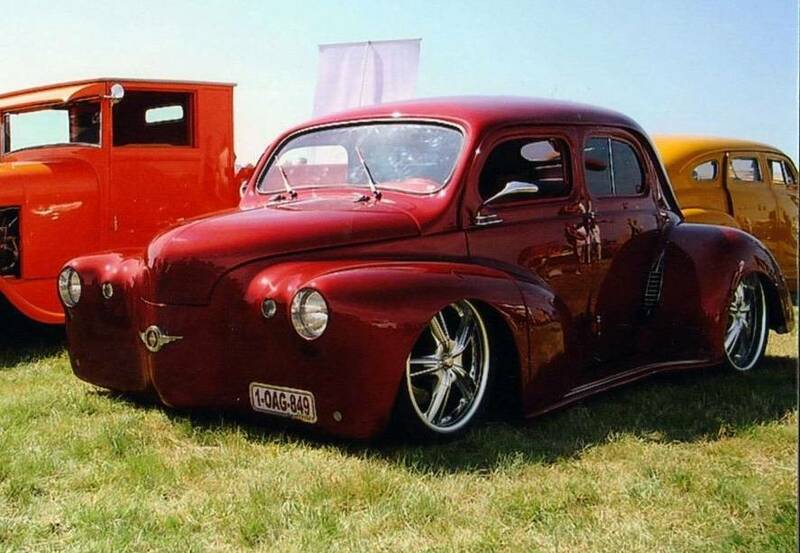 This would have to be the fattest 4CV I've ever seen. Wonder what's in it? Hmm, my earlier reply disappeared, so maybe I forgot to post it! Anyway, what superb artisanal work on the body. Not for me, but that's not the point. Not enough clearance to cross a frozen pea by the look of it too, but that's definitely not his point either. It is amazing what people spend time and money on, isn't it. Interesting - I doubt we'd get a roadworthy with that fuel tank arrangement, but you'd know better than I would on that score! The car already had a bastardised part Aerostable rear end in it, a Ferlec gear lever and I think R10 wheels, so his work wasn't the first. One shot showing the brake shoes had the old 4CV shoe holders not Dauphine ones - wonder what, if anything, he's done to the brakes? Anyway, I then had a look at the second video, and, on the YouTube vertical column to the right was part three, it turns out 'after the accident', which might answer the brake question.... Or not of course. Now there's lots of power with the new engine and some clutch stuff I don't quite understand - clearly the first, larger diameter thrust was neither centralised with the pressure plate nor with pivots quite parallel judging by the extreme wear marks. I didn't know there were different diameter graphite thrusts (although the replacement looks like a needle roller one, which I have on the R8 successfully). Maybe one isn't Renault? What does surprise me is no mention of brakes to match the extra power, although I see a 330 gearbox! Lots of work and enthusiasm. I do like the extra, louvred vents at the rear. COL and J-man like this. Nice, looks better with the steering wheel on the correct side. Sunroof, J-man and JohnW like this. They both should be arrested for crimes to fashion..
Quite special isn't it? I reckon it came to the Muster at Cowra in 2007. Much of my 1950 car is very similar, but windup windows and much stronger suspension and hub rivets etc - the early ones were a bit fragile. I've never seen the choke and starter lever with a knob on them like this appears to have. Mine had a round gear knob like this one but just a eye in the levers to pull on. That's observant! I wondered too. There were various aftermarket gear knobs back then but I've definitely never seen one on a choke lever. It's one rare Renault, that's for sure. We have a handful of 1949 cars around the country (there's one being done up in Perth at present and one in shed or a container in Brisbane and 2-3 mobile I think - haven't checked the Register list in detail. 59 Floride and JohnW like this. Gee, that's nice. I'll flick the link around the 4CV Register. I imagine the US folk will know exactly what it is and I will ask them. Looking at all the photos, it has an R1060 oval plate number, so 1949 (or even earlier) fits. The engine bay is R1060 too, or early R1062, just on the manifolding. But all the obvious stuff like wheels and dashboard are 1957+. He questions the accuracy of the frame off restoration claim on the basis that he believes the 4CV to me monocoque construction. Last edited by FIVEDOOR; 29th March 2019 at 03:42 PM. J-man and jaahn like this. Reached only $3850 USD and did not meet reserve. I had taken it as 1956, given the small hump in front of the windscreen where the air vent would have been fitted on '55 and earlier models, and was deleted by '57. Dash, tail lights are '56 onward. The steering wheel and rear indicators are also after '49. The mustache bars on the front are '53? onward. I think the plates have come from an early car and fitted to the creation for some reason. Surprising! Perhaps it would have looked better without the hood half-up. Well spotted - I missed the hump for the air conditioning! Odd, given the R1060 plate and the very early engine. As you say, it looks as if it's a late construction with early plates. Our French friends don't know the car.